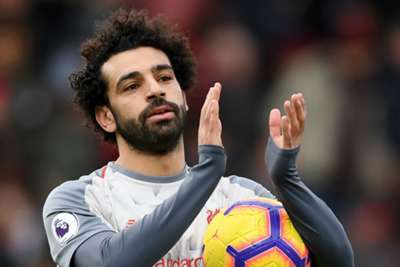 Mohamed Salah carries a "nuclear" threat to Manchester United when they face Liverpool on Sunday, according to Jose Mourinho. Salah played under Mourinho at Chelsea but his initial spell in the Premier League failed to catch fire. He returned last season, joining Liverpool for £36.9million following spells with Fiorentina and Roma, and Mourinho acknowledged the Egypt forward has made considerable strides since they worked together. "He has developed incredibly well at every level," he told reporters of a player who is a key factor in there being a 16-point chasm between title-chasing Liverpool and their bitter rivals United. "Physically, an amazing development. He was a fast, fragile boy and now he is a fast, strong man. "He was psychologically not adapted, coming directly from a small club in Switzerland [Basel] to a big club in the Premier League. "It was too much. I remember I played him at White Hart Lane and at the Etihad and it was too much for him. "Now he plays everywhere against any team – he can go to Barcelona, can go to Madrid and he plays like, ‘I am Mo-Mo Salah and I am afraid of no one and nobody'. "He is a fantastic player, completely different from the potential player we bought from Basel to Chelsea. He was a projective player and now he is one of the best players in the world. "I think the fact that I know him does not help me because I knew the projective player and now he is a top player." Mourinho added: "Every match we try to analyse opponents, we try to analyse the strengths and the weaknesses of the opponent, and when you go to Liverpool they have many strengths, but of course he is nuclear in the strength." His exploits against Bournemouth and Napoli over the past week moved Salah on to 13 goals this season. Last term, the 26-year-old netted an incredible 44 goals but failed to find a way past United. Mourinho reads no particular significance into his team's success in shutting Salah down, pointing out that he now undertakes an altered role since Philippe Coutinho's January transfer to Barcelona. "Different matches, they had Coutinho. Coutinho was playing as a fake left-side player," he explained. "He was coming always inside to play in between the lines. "It is a completely different dynamic in this moment. Salah, sometimes he plays from the right, sometimes he plays as the striker with [Roberto] Firmino dropping behind him. "They have so many possibilities with Salah that it is completely different. "In spite of us wanting to play our own game, I think we have to think about him and give him at least a difficult match."